I've been hunting for this recipe for a long time and was delighted when I finally chanced upon the recipe from Florence of Do What I Like. Upon scrutinising the recipe I noticed that there wasn't any mention of the amount of sugar required. She must have inadvertantly left it out, so I just made an assumption and added in 50 gm of icing sugar which wasn't too sweet and was just nice. The mould that I had was quite shallow resulting in very delicate and easily breakable cookies, so they had to be handled 'gently'! 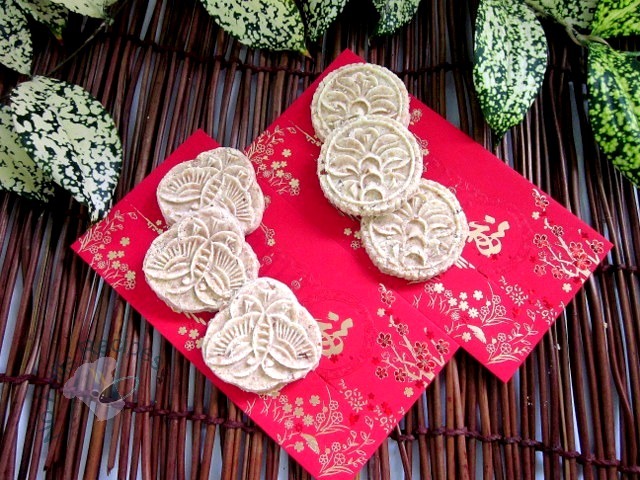 Perhaps you may like to give this a try and make them for the coming CNY! 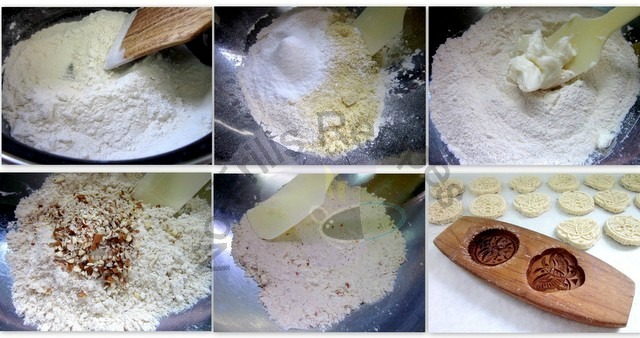 Lightly fry the mung bean flour till fragrant and turned a slight tinge of yellow. Leave to cool. In a mixing bowl, mix the cooled mung bean flour, almond meal and sifted icing sugar thoroughly. Rub in shortening till it resembles breadcrumbs, add in the chopped almonds. Mix well. Add in water gradually to combine the rather crumbly mixture. Press the mixture with the spatula to compact it, now and then. Take some dough, give it a squeeze and if it can come together, then the dough is of the right consistency. Put the crumbly sand like mixture into the mould, press to compact. Knock out the cookie onto a parchment lined baking tray. Bake in a preheated oven @ 140 deg.C for 20 mins. till light brown with the oven door slightly ajar. Let cool in tray, transfer onto a wire rack to cool completely. Store cookies in an air-tight cookie jar. 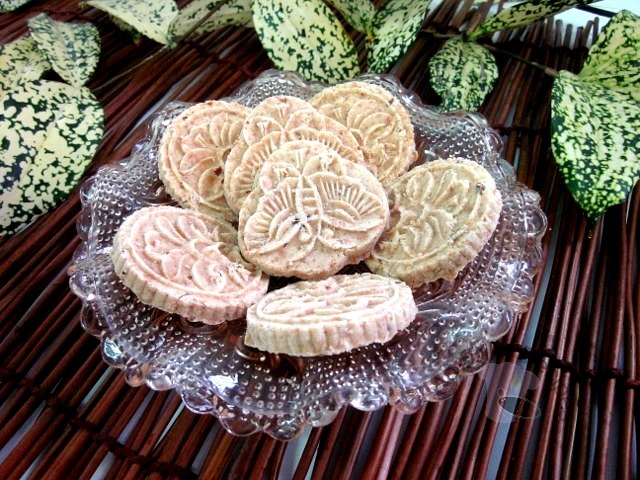 CNY delicacies Cookies and Biscuits Nuts and Seeds Snack Tea. Labels: CNY delicacies Cookies and Biscuits Nuts and Seeds Snack Tea. This mould is a hand me down from my friend's mum. Doubt you can find it nowadays but I suppose you can try to use some other type of mould. The cookies were finished off in a relatively short time. I find it addictive! Oh these are my childhood favorite and they were usually sold in tins, but I have not tasted it for years now as I can't find nice crumbly ones which I love! These sounds awesome! Thank you, Jeannie. They're quite expensive nowadays, so better to DIY! 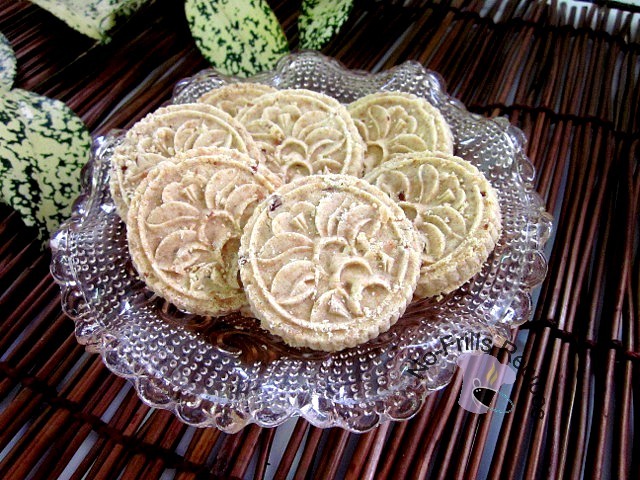 Good morning Cheah, These almond cookies look so pretty and nice plating too! I was looking for this recipe some time back and do chance upon "Do What I Like" too. Your made yours look exactly like those in the store bought. Love to give this a try if time permits as I still have yet to start my cookies yet. Do give this a try, but as I've said, the mould that I used is rather shallow, so they must be handled with 'care'! Thanks for sharing .... just wonder how much almond meal did you used? I will try as the price of these cookies are so expensive now. Oops.... left out the almond meal. It's 30 gm. Thanks for pointing out to me! Have edited the recipe. How pretty! I love the mould too. So you're a silent follower of my blog! Thank you, Cindi! Thank you for dropping by my blog, Doris! Hi Cheah, lovely cookies and moulds. Can only bookmarked this for the time being. Thank you, Kimmy. Take care! Looks like the most likeable shape is the butterfly and I do agree too! I have not eaten this in ages, and seldom see it nowadays too! You're welcome. You can still buy them in the red tins, but this year the price has increased again. the pattern on the mould is so pretty! you know last time i didnt quite like these almond cookies due to that almond taste but slowly i hv learnt to appreciate these cookies more and more ...and also like the chinese almond drink now. Ya, previously I didn't like the smell and taste of the 'hung yan cha', smells of bed bugs! But now, I've acquired the taste for it. Your cookies are just so delicate and lovely. Oh how I would love to try just one but alas, I'm sure they have all disappeared. I think it is wonderful how you "guessed" the sugar. I could never make a good guess and would probably ruin anything I would be baking if I tried. Thank you. Give it a try, if you love almonds, you'll love this cookie. Wish you and your family a very prosperous New Year!